I love cooking with fresh herbs and I am really excited that now instead of going to the grocery store for them, I can just walk over to the window and pick what I need. I plan to use some of the basil to make my Italian Pinwheel recipe. Enter my GIVEAWAY for you chance to win a box of SPAM goodies! Drain noodles well. Arrange noodles in bottom of 13x9 inch baking pan. Add 1/4 cup Asian Toasted Sesame Dressing. Mix well. Sprinkle diced SPAM over top. Arrange lettuce over SPAM. Sprinkle chow mein noodles over top. It is hard to believe, but the month of June is almost over and this is my last SPAM recipe. The last few days have been really hot here in New Mexico. When the weather heats up sometimes we like to have a cold lunch or dinner. This recipe is perfect for one of those hot and lazy nights. You have everything you need for a delicious refreshing meal all in one dish. What is the most popular way to eat SPAM? What is the most popular way to eat SPAM? It turns out, it is the same way my mom made it for me when I was a little girl. She would fry it up in a pan and put it between two slices of bread to make a sandwich. I still like the occasional SPAM sandwich. Before SPAM sent me the box with their products in it, the only thing I had made with SPAM were sandwiches. I have had so much fun creating recipes using it! I am amazed at all the delicious dishes you can make with SPAM, like my SPAM-ellini recipe. Have you ever had a fried SPAM sandwich? In large skillet, brown potatoes in butter over medium high heat. Add SPAM, eggs, and salt and pepper to taste. Scramble mixture until cooked through. Divide egg mixture onto tortillas. Spread salsa over egg mixture. My husband's Stan thought he had died and went to heaven when he saw that SPAM had bacon in it. That man loves bacon like Paula Deen loves butter. It was a perfect addition to my breakfast burrito recipe. SPAM is fully cooked, so all I had to do was dice it. Breakfast burritos are my husband and son's favorite breakfast. I usually brown the potatoes the night before and cook and dice the meat, that way I can quickly get breakfast on the table in the morning. The burritos also reheat really well, so I typically will make extra burritos and have them waiting for my hungry guys in the refrigerator. SPAM Mac 'N Cheese Pizza Link and How Did SPAM Get It's Name? How did SPAM get it's name? Like most people, I thought the name SPAM was a combination of spice and ham. The truth is the name SPAM means just SPAM. Jay Hormel held a contest to help find a name for this tender, sweet and savory meat in a can. The name SPAM was selected and the winner, Kenneth Daigneau received a $100 Prize, which was a lot of money back in 1937. 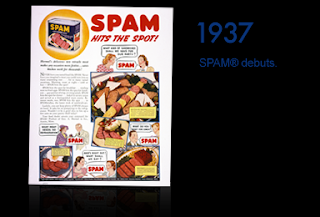 From the first can to the seven billionth, SPAM® products have remained a versatile, high-quality and great-tasting meal-time favorite. They have also changed to meet the needs of an ever-changing marketplace. The SPAM® Family of Products appeals to the varied tastes and lifestyles of people around the world. SPAM sponsors recipe contests at state and county fairs. Last year at the Iowa State Fair, the winner of the SPAM contest shared her winning recipe with me. SPAM Mac 'N Cheese Pizza is comfort food on steroids. Preheat oven to 400 degrees. In medium bowl, combine all ingredients. Mix until just combined. Fill greased muffin pan cups 3/4 full with batter. Bake 25 to 30 minutes or until golden brown. Makes 12 muffins. On Memorial Day, we went fishing with our friends Jerry and Karlene and their kids. We caught 19 Rainbow Trout fish! Later in the day, we had them over to our house for a fish fry. Whenever I have friends over for dinner, they become my guinea pigs taste testers for new recipes. SPAM Corn Muffins, is one of the recipes that I tested on my friends. 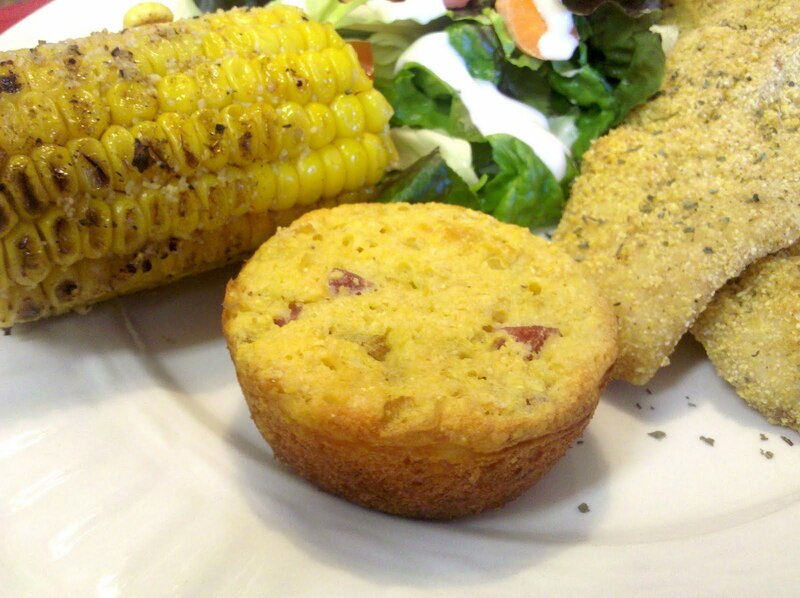 Corn muffins can be very dry, but this recipe created muffins that were moist and full of flavor. 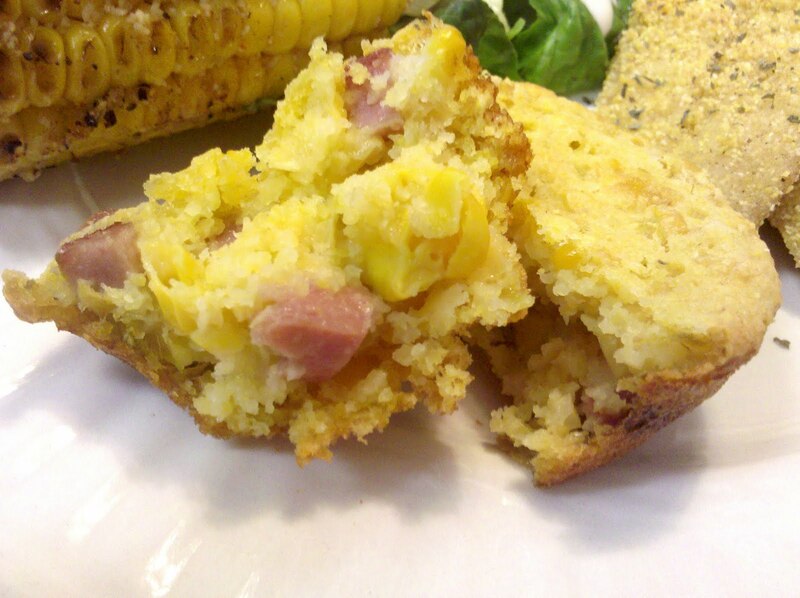 The combination of the sweet muffin mix and cream corn, with the savory diced SPAM and green chile, was a real crowd pleaser. I was recently contacted by a SPAM representative. They offered not only me, but also one of my blog followers, a starter box of SPAM products, plus a beautiful hand pained trivet and a SPAM spatula! The contest rules are easy! 1. Leave a comment letting me know you follow my blog and share what your favorite recipe is. 2. For an extra entry "Like" Spam on Facebook. Leave a comment telling me you did so. 3. For a third entry follow SPAM @RealSPAMMYCan on twitter. Leave a comment telling me you did so. If looking at the delicious SPAM products has you thinking about all the wonderful dishes you could create with it, maybe you should enter the SPAM contest for your chance to win $1000! Contest details are below. Enter the SPAM® Dish This! to create the ultimate weekend brunch recipe. a year's supply of SPAM® products. Slice SPAM into 1/3 inch slices. Grill SPAM over medium heat until grill marks appear. Remove from grill. Slightly cool. Dice SPAM. Set aside. Prepare tortellini according to package directions. Drain. In large saucepan, add cream and cheese, cook over medium heat until combined and creamy. Add SPAM, peas, and sun-dried tomatoes. Mix well. Add tortellini. Toss to coat. Makes 6 servings. I was recently contacted by a SPAM representative. They offered me a starter box of SPAM products, plus a beautiful hand pained trivet and a SPAM spatula. Looking at the delicious SPAM products, my mind began thinking of all the wonderful recipes that I could create using SPAM. So that is why June is SPAM month here on My Kind of Cooking. Keep checking back all month long for more delicious SPAM recipes and tips! To kick off this month of tasty treats, I created SPAM-ellini. I had never grilled SPAM before, but I was so pleased with the results, that I plan to grill up another batch soon. The sauce was creamy and not too rich. The sun-dried tomatoes added a depth of flavor to the sauce. But the real star of this recipe was the delicious grilled SPAM! The great flavor and texture of the SPAM, complemented all of the other ingredients, to make a dish where everyone went back for seconds. how you can win your own box of SPAM goodies!